In 1931, the building of the former Landowners’ Real Estate Bank was delivered to the National Library. 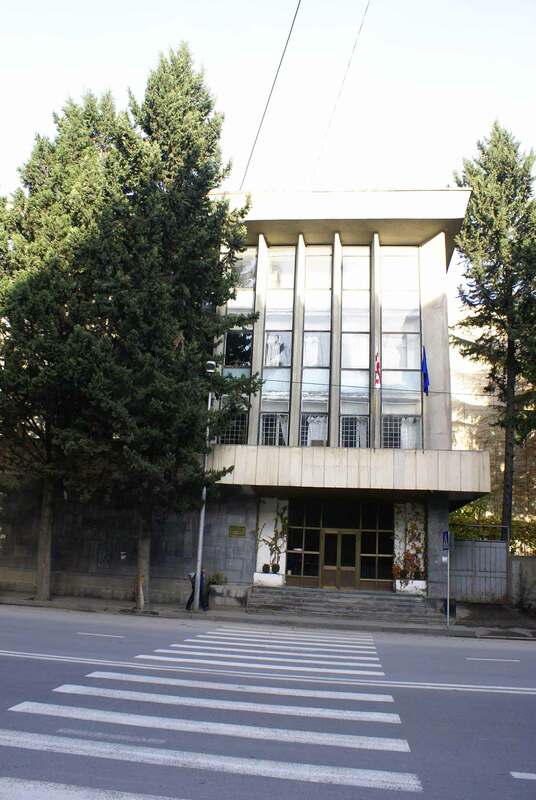 Now, this building represents only one of the blocks of the National Parliamentary Library of Georgia, but the entire library is located within five buildings and three of them are recognized as prominent architectural monuments.The former Landowners’ Real Estate Bank or a Georgian Bank, now the first building of the National Parliamentary Library was built (located in the corner of L. Gudiashvili and N. Vachandze streets) in 1913-1916.In 1912, the competition terms of the bank construction project indicated that the building should be designed in "Georgian style”. With this requirement in view, the first price was awarded to the project designed by the architect Anatoli Kalgin and the painter Henry Hrinevski. Both contestants were thoroughly knowledgeable of the Medieval Georgian architecture (Anatoly Kalgin had already done the measuring of the Bolnisi Sioni Church and a number of other monuments located in Tao-Klarjeti, as well as the reconstruction project of the Bana Monastery; as for Henry Hrinevski, he was an expert of ornamentation and adornments characteristic to Georgian monasteries and it was him who illuminated the works of an outstanding Georgian writer and public figure, Ilia Chavchavadze). The façade decoration of the library is copied from the adornments of the facades of the Georgian monastic monuments of the 10th-13th centuries whereas carving of the ornaments of extraordinary shape was accomplished by Vladimer and Lavrenti Agladzes. A vast gallery or logia built upon a number of columns from the Gudiashvili street side, as well as the side gallery and a tower erected in the corner with ornamented casements and rhombs are determining the characteristic feature of the entire building. Paintings of the interior, vestibule and arches of the former operational hall (today’s reading hall), the plastic forms of the stone balustrade characteristic to modern style and other architectural elements make this building an accomplished pattern of old Georgian architectural motives, which have played an important role in further development of Georgian architecture. The ornamented door of the library is done by Botkoveli. The woodworks in the first and third blocks of the library were done by Ilia Mamatsashvili. The building of the second block of the National Library (located in the corner of the Gudiashvili and Purtseladze streets), represents a reasonable continuation of the first block. This is a former building of a branch of the Volga-Kama Bank, which was built by the architect G. Kosiakov in 1915. You would read the following lines in mass media facilities of those days: "On June 12, the Tiflis Branch of the Volga-Kama Bank moved to their own building. 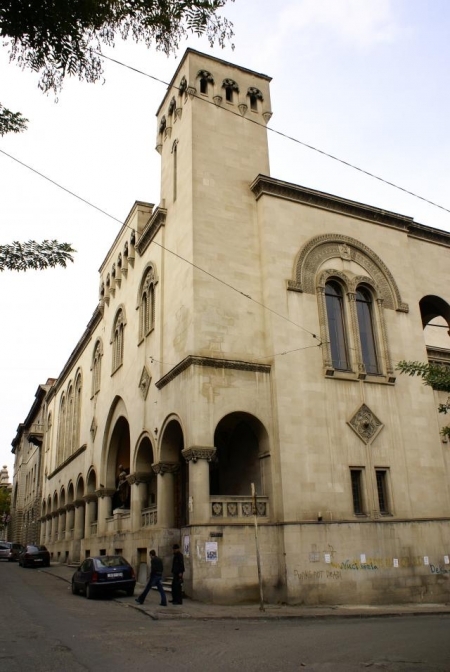 The branch started its activities in Tiflis, in 1908 and a year later, they opened the affiliated agencies in Yerevan and Ganja. Construction of this new building located in the corner of Baron and Loris-Melikov streets was started in 1914, according to the project drafted by the architect-Academician G.A. Kosiakov. The land was purchased from Countess Melikova and half of this land, approximately 300 square ? was delivered by the bank to the Tiflis Landowners’ Real Estate Bank, which is also engaged in construction of a beautiful building for their own needs. The Volga-Kama building is large and fine-looking; it contains 30 rooms and a nice storage area as well as the flats for their staff and workers. The building is equipped by central heating”. (People’s Messenger, 1916, N598, pg.2). Architecture of the second block of the library should be regarded as a replica of the neo-classical style. The heavy rustication of the façade of the first floor is creating a contrasting picture with the plain surface of the second and third floors. A broad protruded part is accentuated on the façade, in which a gigantic arch-type portal is cut. The third building of the third block or the former office of the State Bank was built in 1910 (N7, L. Gudiashvili street), under the project drafted by Micheil Okhanjanov and R. Golenishchev. 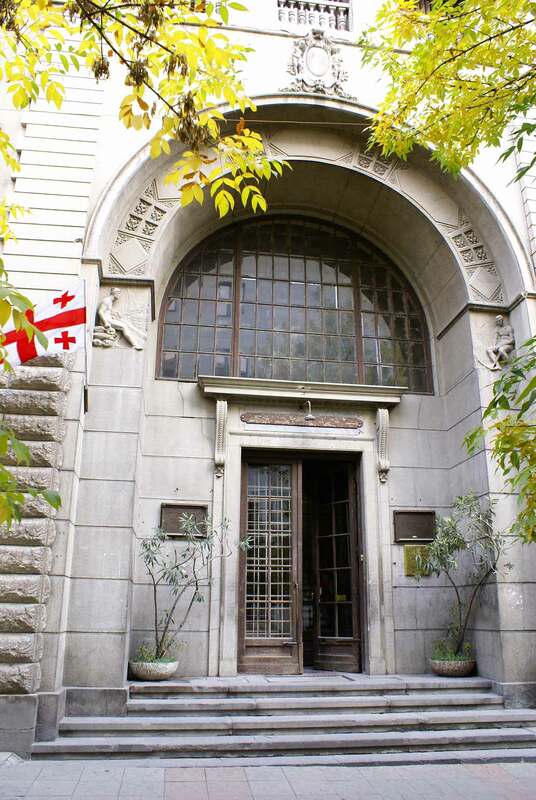 It is one of the best among the modern style buildings which have survived in present-day Tbilisi. Decoration of the portal located at the rear end of the façade the shaped capitals of gigantic rusticated columns, the sculptured decorations of the waved belt layer, the waved fronton with a high relief of an eagle etc. speak for the modern style. The interior as well as the plastic architectural elements and the glass-window ceiling also bear the signs of modern style. The building is circled in the corner of the Gudiashvili and Purtseladze streets, with a balcony all round it. The modern style is vividly represented in the interior part of the building as well. The fourth block of the library was built according to the project drafted by V. Jitovski in 1973. 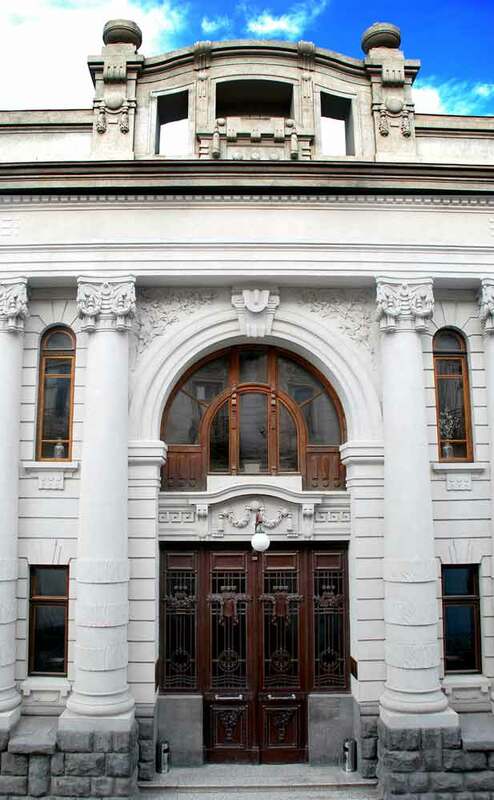 In 1971, a four floor building decorated with white basalt stone columns was constructed in order to locate the Public Book Chamber (architect: T. Chogovadze). Attached to the building is a vast, six floor repository, in which a real treasury of printed production in Georgian language is accumulated. In 2006, the Public Book Chamber with its funds and the building was delivered to the National Library.